Out on a local trail at the weekend, while bouncing through a rock garden, something put a 5mm hole in the tyre, no way the sealant could cope with that so a tube was needed. Once back home 5 minutes, an upholstery needle and 1m of dental floss effected a repair good enough to allow the stans to work and the tyre to hold air again tubeless. On various MTB forums what to put in the base of the OneUp EDC system has been discussed plenty. The best idea we’ve seen was a tubeless repair insert tool, so we made one. Rear wheel rebuild of 700c commuter wheelset. 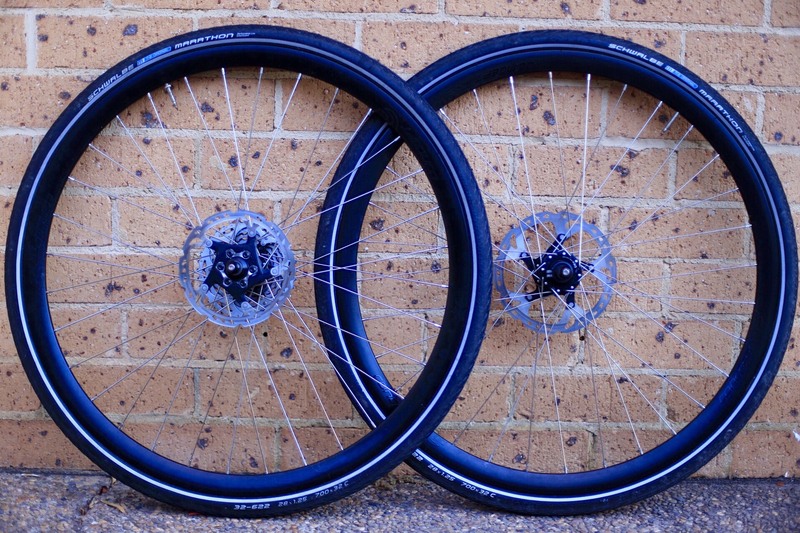 Robust wheelset for urban duties. The rebuild was to remove an Alfine 8 IGH hub, which felt heavy, vague and weak, to replace it with a Hope Pro2 and 10 speed cassette drive train for a lighter, more direct drive feel. So our new OneUpComponents EDC tool systems have arrived and I couldn’t wait, I went straight out to the garage to fit them. To save you reading this long winded rambling post I’ll cut to the chase. Based on a weekend of riding I love them, they are fantastically innovative and work spectacularly well. I’d recommend one to any cyclist (mountain biker, roadie, bikepacker and/or commuter) with a tapered steerer. There, done. But if you want to know why I like it you’ll have to read on. OneUp Component’s much anticipated EDC tool/storage system is now available to those who have registered interest. I have my order confirmed and I’m looking forward to getting my hands on mine. With the release has been a stack of information I haven’t previously seen including detailed fitting instructions, weights and dimensions etc etc.